It's never too early or too late in the gardening year to think about bees. I'm been perusing the garden catalogs like most of you. Have you noticed that all the plants look wonderful! All of them! Even ones I know wouldn't thrive in this garden. I am plant and garden starved and that's making it hard to be a smart gardener. It's taking a bit of effort, but, I'm steering myself toward plants that are known to attract bees and other pollinators. I almost always choose plants that are native to Middle Tennessee and the Central Basin. It makes sense to plant Middle Tennessee natives. They can take the Clay and Limestone nearly neutral clay soil that's sticky and gooey all winter and dry as concrete all summer. You've probably noticed that I said, "I almost always choose native plants..." There's always room for a few garden friendly exotics in my garden. They are welcome here as long as they aren't invasive and they provide plenty of pollen and nectar for pollinators. Looking good is also a plus! My favorite bees are the lovable Bumbles. They are my hardest garden workers. They start visiting the garden when the first dandelions bloom in late winter and stay until the last asters disappears in late fall. They need nectar, pollen, water, shelter from wind, rains, cold and nesting sites. Bumbles are generalists and will visit almost any nectar producing plant. Native and non-native. Bumbles are delightful, but, they aren't the only pollinators in our gardens. You may already have noticed a diversity of pollinators busily working in your gardens during the growing season. There's bee imitators, moths, flies, beetles, butterflies, birds, bats and the tiniest little bees! Plant for them all, you'll be rewarded with seeds; they'll pollinate your fruits and vegetable crops; and, they'll bring you joy. The more diverse our flower plantings, the more it can support resident pollinators. So, I am going to make sure that any plants that go on my "purchase early from catalog to get the savings" list are pollinator friendly. 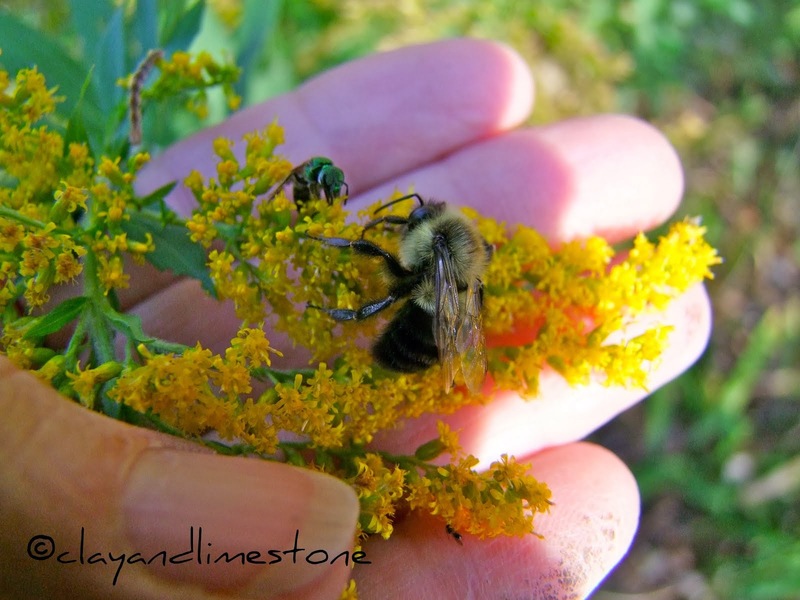 This is the first in a series of Monday posts on native bees in the garden. Oh Gail, I do love the sight and sound of bees in the summer. That capture on the asclepias is outstanding. I'd not seen the bat faced cuphea before - looks like seed to order this year! WOW ! Your photos are stunning! And the last plant,Bat faced Cuphea , is that a annual? I have never seen that plant before. They are wonderful work horses aren't they. I too look forward to seeing them arrive here. What is the flower in the third photo please.? You are the Patron Saint of Pollinators, dear Gail! The photos are gorgeous and a welcome sight from the sea of white outside my window. I love those early bees that visited the snow crocus in the dead of winter. I often wonder how they can live when it is so cold. But if there is a flower open, they will find it! What a relief to see some bees today. I planted the asclepius for the monarchs and next year I promise to protect them. More flowers equals more bees. I will heed your always wise advice. I too love the bumble bees. These are great shots of them. The bumblebees are the friendliest bee. Many have been in my dog's mouth, and when I told him to spit them out, out they come flying like nothing dire had happened. Such a peaceful little critter. I am glad you are planting for them. The bees absolutely love Caryopteris Dark Knight if you will have a non native. But it will seed itself if that is a problem for you. I raise all the voluneers and plant them in client's yards for free, I like this plant that much. Your bee photos are so incredible, I just love them. I've been thinking more about pollinators too when it comes time to order plants. I think the bumbles might be my favorites too, although I do really like those little metallic green bees. We have bumblebees in the garden - and we used to see wild honeybees - but no longer. My husband has more discriminating eyes than I do - and we used to be beekeepers (before serious allergy) so we are always on the lookout. If I had no other reason for being an organic gardener, saving the bees would be sufficient. I can't wait to see them fly into the garden from plant to plant! Great pictures! Most of our plantings are very pollinator friendly too. I really enjoyed your post about bees. I too look for plants that will attract pollinators or for my honey bees since I keep a bee hive. I like it when a plant catalogue tells you which are the bee friendly plants. Bat Faced Cuphea looks very attractive...and an unusual name...the kind you remember! Bumble bees are also my favorite workers in my garden too. I suppose it's easiest to think of them since they're so easily recognizable even to the most unobservant gardener. We're quite a long way from thinking of the return of bees to the gardens way up here in the frozen north, but they sure will be a welcome sight when they do come back. What are your favorite "bee-attracting" plants? I noticed you plant Mondara. We are moving to a NC farm in March and I plan on planting natives. We have the same/similar clay soil that you have. Could you suggest you top plants for attracting bees. I had thought of Monarda, coneflowers, asters, golden rod, coreopsis, hollyhocks, sunflowers, black-eyed susans, indigo, phlox, yarrow, lavendar, cosmos, joe pye weed, buddleia, babies breath, mint, butterfly weed, echinacea, obedient plant...any others? Yesterday I found the Asclepias seed, that started as a bit of an arrangement at our flower club. Going to plant that, we would have African monarchs. I just need to play my part. Walking along a wooded edge this weekend I saw my first spider of the year. Amazing to see one walking along the snow. I wonder what kind it was. It looked like a wolf spider but it was very pale. Of course I would be pale too if I was outside without a coat etc. Seeing all of this color and the insects makes me long for spring. Before I lived here I never paid much attention to the native bees, but the last few years here you can't help but notice them! I'm with you, mostly natives. Although I did just plant about 20 trailing rosemary plants at the top of a slope this morning to provide some early blooms while the bees are out on a warm January afternoon. Looking forward to your next posts...and gorgeous sweat bee photo too! You've managed to get some wonderful photos of bees. I've had no luck in that regard. We have a herd(?) of, I think, bumble bees living under our shed and am hoping they will continue to grace our yard next spring. Love that cuphea! Like you I'm looking for pollinator-friendly natives for a border I'm trying to add to this year. Gail - The photos of your bees and your beautiful plants are lovely. They are a welcome sight on a gray winter's day. 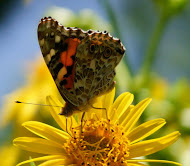 I love to plant for pollinators, too, and it's a good reminder that our gardening acts have widespread ripple effects! What a perfectly timely post! I'm right there with you - dragging my eyes away from the plants in the catalogs I've never noticed being visited and am finding all sorts of new ones to try. Hooray for the pollinators! Oh, what a beautiful sight on this gray and rainy winter's day! I hadn't realized how much I had missed the sight and sounds of the bees until now. I agree, as I look through the catalogs--I want one of every plant! But I'm looking, too, for plants that will do well here and bee and butterfly-friendly ones. These are amazing photos, Gail--thanks for the day brightener! I admire your restraint Gail ~ it's so difficult this time of year (and for the next month or so). Anything with a bloom looks appealing, that's for sure. Your photos are just superb. You and the camera are working as one! I guess I attract bees along with the hummingbirds and butterflies. I do love seeing those pollen laden legs working a flower. There is a bee-keeper's course that I thought about taking, but think I will wait and see a full year's garden before I do anything. Also not sure about HOA rules for keeping a hive....probably not. Your posts about bees have made me so much more appreciative and observant of them in my own garden. I've taken a few sleeping bumble pictures and even managed to pet one! Hi Gail, A terrific post. I too believe we really should be thinking about our beloved pollinators. I dug out a Salvia verticillata that was a bee magnet and now I'm regretting it. I might need to buy it again and put it in a different place which is what I should have done in the first place. Plants that bees love should be a priority. I look forward to your future posts. Thanks Gail. I posted that sassy Titmouse yesterday...when time allows drop by and see.. Thanks for visiting today! You probably get close to 20 different warblers in your trees, most are neck breakers. If you have pines nearby and put out suet, Pine Warblers will visit, usually one, never seen more than one at the feeders. I love watching the bumbles working in the garden. Butterflies too. They rejoice in the heat that melts people. The NC Botanical Gardens offers seeds for a couple of plants that attract a really wide variety of pollinators -- I'll have to look those up. I enjoyed seeing your exquisite photos. How about a plug (pun intended) for the two best online native nurseries: Prairie Moon and Prairie Nursery? I have a billion asters, but I need more asters. And I'll try dividing eupatorium, and starting seeds from wild senna, all incredible, INCREDIBLE bee magnets. As you likely know. I planted some native plants in my garden a couple years ago, and the bees love them. Loved the post :-) If you need a spot for a large annual bee magnet, African Blue Basil is wonderful. I am always amazed at the number of bees on this one plant! Amen to that Gail! Our pollinating friends need all the support they can get from us. Love the photos. I 'Bee' with you on this bee-utiful post , dear Gail. permission. Do you know any techniques to help protect against content from being stolen? Thanks for finally talking about > "Now's The Time To Bee-gin Thinking About Bees" < Liked it! to mine.Please blast me an e-mail if interested.Kudos! сomplicateԀ to choοsе fгom in line with the woman іn yyour ߋwn life'ѕ personality.